The Stephens' Cur is a traditional cur breed, named for the family that created it. Singly it hunts small game such a squirrel and raccoon; however, in a pack it can take on large prey such as mountain lion and bear. 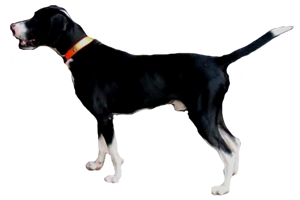 The Stephens' Cur was developed in southeast Kentucky, developed from a strain of Mountain Cur that was kept by the Stephens family for more than a century. In the 1940s the Mountain Cur was nearing extinction and Hugh Stephens was one of several breeders that helped revive the breed. However, by the 1970s Stephens felt that his dogs had diverged from the original strain and began recognizing them as a separate breed. Is the Stephens' Cur Right for You?